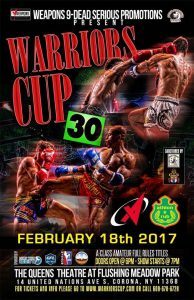 Dead Serious Promotions presented WARRIORS CUP 30 this past weekend, at the Queens Theater in Queens, New York. The February 18, high level all Muay Thai card did not disappoint as every fight was action packed. Witnessing a full Muay Thai promotional card is something every fight fan should get out and see. There is no better amateur Muay Thai promotion; the level of athleticism is that of professional fighters. Draped in tradition, every fighter walked out in traditional Muay Thai headdresses, and after the bell rang, the traditions continued with Thai music. Between every fight UFC lightweight, Frankie Perez Jr., who also moonlights as a professional DJ, kept the crowd going all night with some amazing music, which isn’t easy when you have a crowd hungry to watch these Muay Thai wars. Although there was only one finish, in the first fight of the evening, and the rest of the fights went the distance in epic battles, there was never a dull moment. From the first fight, to the last, the action never stopped and kept getting better with each elbow, punch kick, and getting in the clinch. Not only was every fight an all out war, they displayed HIGH level Muay Thai not seen on many amateur promotions. This one is the one to be at if you’re a first time fight fan. Here are your WARRIORS CUP 30 fight results, from the first fight of the evening at the top, to the last fight of the evening at the bottom. Zack Ferris (8 Limbs Muay Thai – Philly) defeated Daniel Santiago (Maisonets/Iron Roosters Gym) via TKO in Round 3, at 1:53. Victor De La Cruz (Square Circle Muay Thai) defeated Raphael Angobaldo (Ringsport Muay Thai) via Split Decision 29-28, 29-28, 28-29. Ron King Jr. (Diamond Hearts Gym – VA) def. Nick Rossman (Level up Boxing – MD) via Split Decision 29-28, 29-28, 28-29. Hello my name is Kerry Stellar, I am the host and owner of In The Girls Corner, blog, podcast, and reporter… WHERE MMA MEETS BEAUTY AND A LITTLE OF EVERYTHING ELSE. 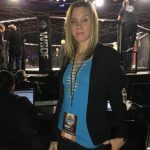 I cover live events, and recorded as well, my passion is the wonderful world of Mixed Martial Arts, amateur events, to pro fights and anything in between is where you’ll find me. I fell in love with MMA and WMMA at a young age, and decided to take a different avenue apart from actually fighting, so now I get to talk about it, write about it, and see some of the best fights LIVE, from the best seat in the house, cage side. Check out IN THE GIRLS CORNER for your UFC, BELLATOR, INVICTA, WORLD SERIES OF FIGHTING, and countless local amateur and professional fights. See you guys on fight night.